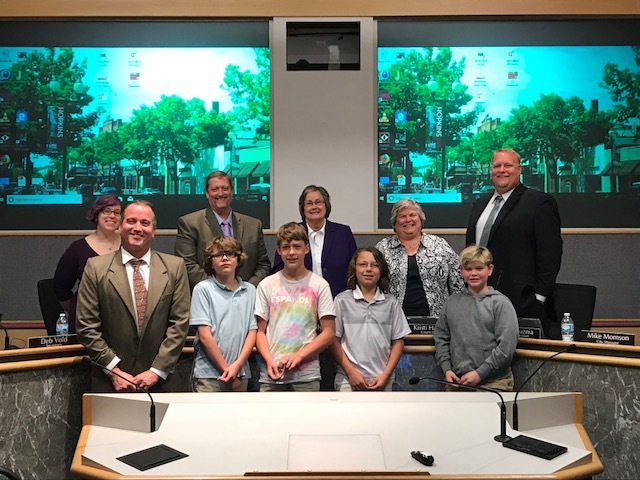 6th graders Wyatt, Will, Aiden, and Brady, accompanied by their exhibition mentor Jeremy Perrin, presented a proposed ordinance to the Hopkins City Council relating to the use of plastic straws. They explained how they were studying the United Nations Sustainability Goals for their exhibition, and presented a very convincing case to the council. Hopkins Mayor Molly Cummings thanked them for their presentation, commenting that the future is bright when young people like our ISLA students are concerned about the state of our world, involved in the issues, and engaged in the community. After picking up their caps and gowns, ISLA alum Sarina Bissell, Sophia Koritz, Abby Martin, Sylvie Gitler, Steven Maine, Jack Wilson, Logan Hoffman, Jasper Johnson, Fionna Tejada, Ray Brown and Pierce Hoaglund boarded a bus to bring them back to where it all started. 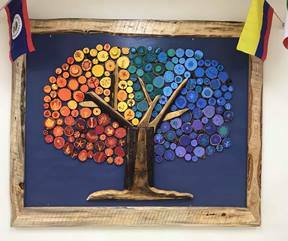 They were greeted by teachers and administrators from their time at ISLA – Karen Terhaar, Ximena Rayo, Briana Bentz, Cori Adams and Sarah Devers. As they paraded through the building they were cheered on with high fives from all the current staff and students. Fiesta de la Primavera 2019 will be May 4, 2019 at Plymouth Creek Center in Plymouth. 2018-19 LA Host Families Wanted! WE NEED ISLA FAMILIES FOR OUR 2018-19 HOST FAMILY PROGRAM! We’ve raised the $ to bring our Language Ambassadors to ISLA, now we need to make sure they have a roof over their heads! Let YOUR family’s home be that roof. This wonderful opportunity is available for either fall or spring semester next year - we still have need for both. Contact Kim Gelperin (kimgelp@gmail.com) or Meggin Gregory (megginoleson@yahoo.com) soon to receive more information about hosting. Looking for a way to take the headache out of school supply shopping this summer? New for this coming school year (2018/2019), all ISLA families will have the opportunity to skip the hassle and have SchoolKidz do all the shopping for them! With an easy online ordering process, school shopping can now take 5 minutes and also raise money for ISLA. Go to www.shopttkits.com and enter account #28056 by June 22, 2018. Kits will be delivered to the classroom! We still have many openings for all kinds of great gatherings and staff events. You can sign up for them on SQUARE. https://mkt.com/isla-pto A few of the gatherings/events that are coming up soon are listed below. As events are filled they will no longer be available, act now! WHAT WAS SOMETHING YOU DIDN’T EXPECT LIVING IN AMERICA? Almost everything was what I expected. Plans for summer and next year? I’m going to be in a school in Barcelona as a fifth grade teacher in and the evenings I will come back to work as a soccer coach. In summer I’m going to California and Cuba. A FAVORITE MEMORY OF THIS YEAR: One of my favorite memories was going to the cabin close to Duluth and the experience of staying in a cabin by a lake. WHAT WAS SOMETHING YOU DIDN’T EXPECT LIVING IN AMERICA? Something that I never expected to experience was baking cookies before Christmas with all the family together. Another thing I didn’t expect was walking over a lake and watching an art exposition. OTHER THINGS TO NOTE: I think it was a really good experience to live with families because it is a unique way to live the complete American experience. PLANS FOR SUMMER AND NEXT YEAR: This summer my plans to work with kids all summer and for next year I will study for the exam to be a teacher in a public school in Spain. Hosting an LA is such a great experience! We had the opportunity to host Cristina this fall and are so thankful for the time we had with her in our home and the lifelong friendship we created. We had an idea of what to expect in hosting an LA since Jaiah’s sister’s family hosted two LA’s over the past couple of years and both are now part of our extended family. Cristina quickly became integrated in our family as well! It’s hard to summarize the experience we had, but will share a few highlights of hosting. We enjoyed sharing our holiday traditions, including taking her trick-or-treating, indulging in a big Thanksgiving dinner, and the various Christmas celebrations with our family. Cristina also shared her holiday traditions, including how their Christmas celebration is centered on the Three Wise Men instead of Santa Claus. Cristina’s family sent a variety of treats that are shared during the holiday season, so we were able to try out the various forms of Turron (yum!). In addition to sharing the holiday traditions, it was great having the day-to-day moments with Cristina. From the many conversations on the commute to/from school, playing with the kids, the chaotic morning rush, doing homework with Audrey and encouraging the kids to speak Spanish, and enjoying family dinners together. Food was one of the things Cristina missed most from home. She prepared a couple of her favorites for us to try: lentil soup, tiramisu, tortilla de patatas. During the time Cristina was with us, Spain was undergoing the potential of Catalonia separating from Spain. We were able to hear firsthand how this would impact the country and gain a better understanding of the history leading up to this. We had many conversations on the political landscape across the US and the rest of the world. Hosting also allowed us to get more involved in the ISLA community and meet other host families. We got to know the other LAs and gain a greater appreciation for the LA program and all of the work that goes into making it successful. All is done through volunteers, which is one of the reasons ISLA’s families are the best! If you haven’t already hosted, I would encourage you to consider opening your home and your hearts to a future LA. You won’t regret it!" We are coming to the end to another great year! For my family, after 11 years, we are ready to move on and leave ISLA in the many able hands and fabulous families that have since joined our ISLA family and stepped up to carry on our wonderful traditions. One great highlight of our years is the experience of hosting an ISLA Language Ambassador. We have hosted three times over the years. This year we hosted Diego, from Palencia, Spain! The first time we considered hosting, we felt unsure. We didn't know what the experience would be like. We have a busy life with three children and careers. Would we have time for another member of our family? Also, we didn't have an official guest bedroom. We had to move the kids around a bit to make the space. But we decided to give it a try. We never looked back. The next two times we suggested hosting, the response from the kids was a resounding "Yes!" It's true that your family will make some adjustments. But what you get out of it is so much more! For our family, the kids really love forming a relationship with an "older sibling" and we loved sharing cultures. We even visited our former LA's in their countries (Gisela in Mexico and Alba in Spain)! If you are on the fence about hosting an LA, just go for it! As we approach the end of the year, we are sad to see Diego leave but also so thankful that he could be part of our family. We know he always will be! I once said, and I'll say it again; Hosting an L.A. is not hard-- the hard part is saying goodbye. I’d like to share a bit about our experience hosting an LA this fall. It was such a pleasure having Anna live with us. She brought much love and enthusiasm to our everyday lives. It was so fun to see our lives through her perspective (seeing her face the first time we walked into Costco was priceless) and it was great to share with her all the traditional things we do in summer, fall, and winter here. Seeing it through her eyes brought an extra level of depth and joy to our lives. Additionally, the parts of her culture that she brought from Spain to our home were so much fun. Not to brag, but after extensive coaching, I have now mastered the “Spanish tortilla flip”. Hosting an LA is like having a fun younger relative come and live with you, someone who loves and plays with your kids and and whose life you get to share for a memorable period of time. If you’re on the fence about hosting, I highly recommend trying it out. Your kids will it. We know our kids will remember this experience forever, and our family has made a friend for life. What a year! Many, many thanks to everyone who has helped the ISLA PTO this year. We had some big changes - new web site, new lead for Fiesta, and many new faces joining the PTO. An extra big THANK YOU to Tasha and her team for pulling off such a success this year (in spite of that snowstorm!). 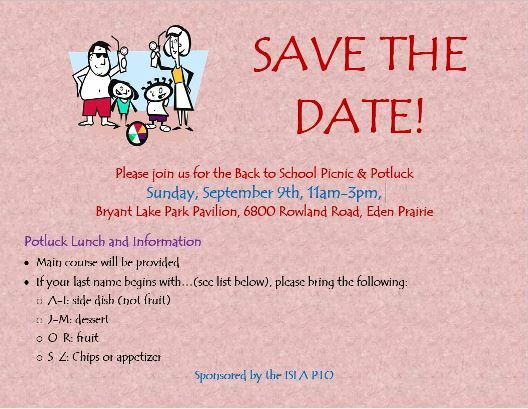 I enjoyed being part of the PTO and helping the ISLA community. I think we are set for another great year ahead. 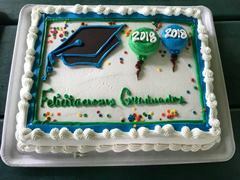 I would like to give some final "Thank You's" to all the parents and people who have put so much time and effort into volunteering for lunch, class parents, chaperones, PTO board members, event volunteers and everyone else who gave a little (or a lot) to building this community.